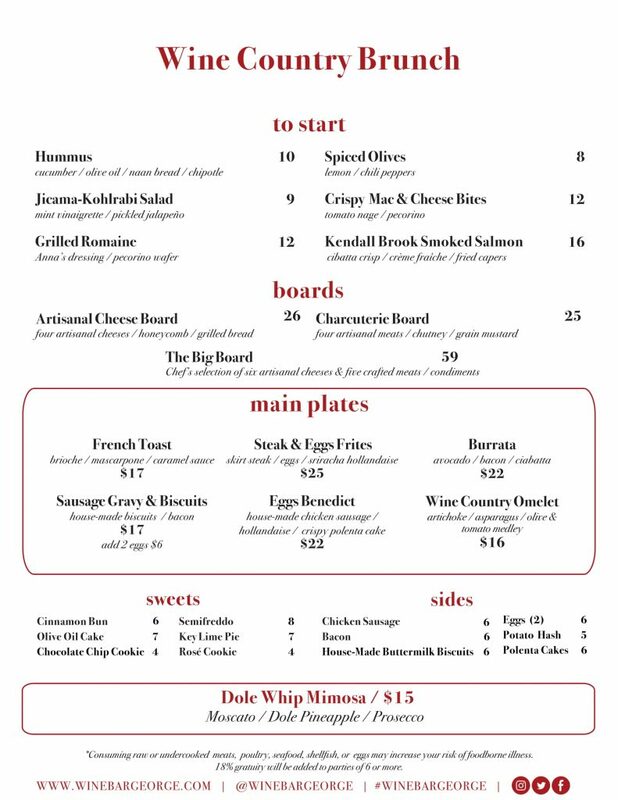 We return to Wine Bar George today to try out their brand new Wine Country Brunch. 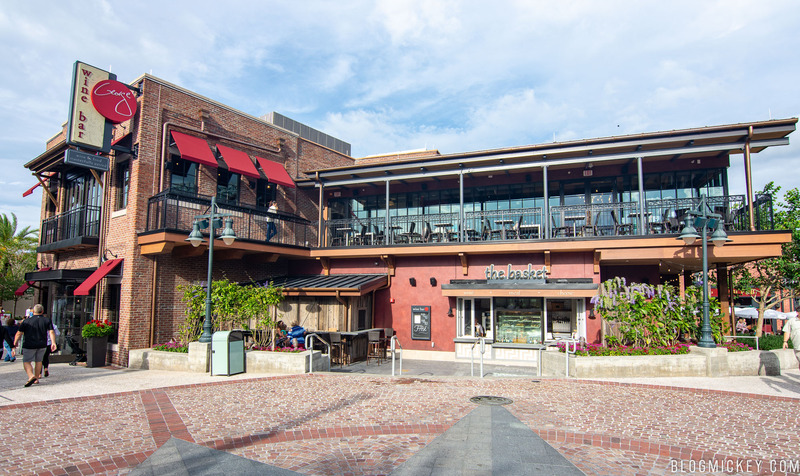 Wine Bar George is a table service restaurant located in The Landing at Disney Springs. We’ve been more than a few times over the 10 months that the establishment has been open, trying both their regular dinner menu as well as their lunch menu. 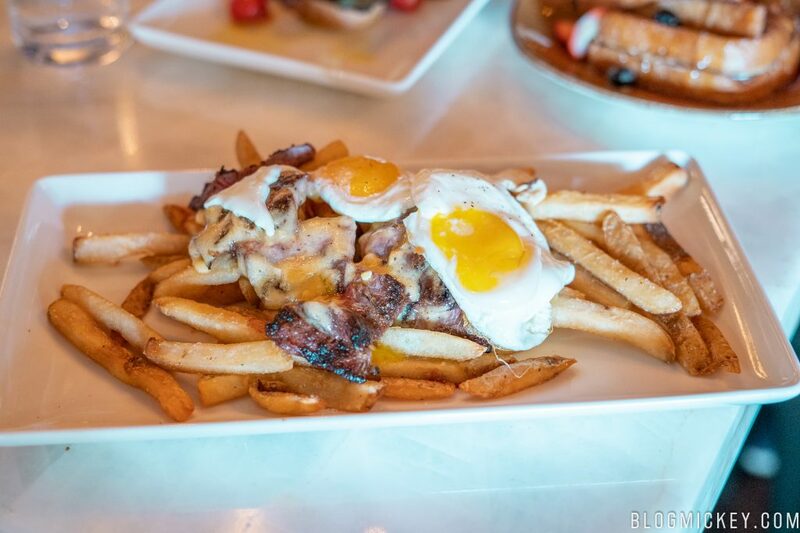 We’ve been quite impressed with what owner George Miliotes has put together so far, which meant that we had to return today to try the Wine Bar George Brunch. Here’s a quick overview of the menu, followed by our thoughts of each of the items we tried. 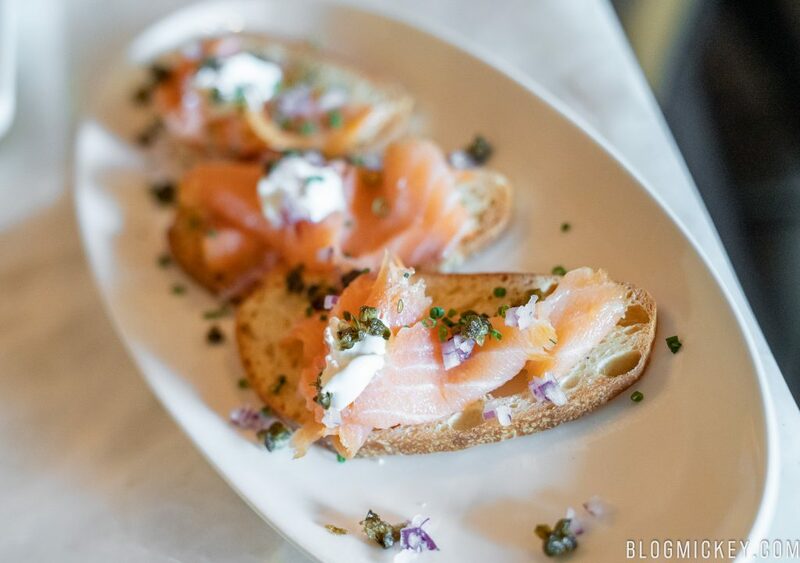 The Kendall Brook Smoked Salmon is the only new item on the appetizer menu. That’s probably for the best too, as Wine Bar George already does a fantastic job with the regular appetizer list. If salmon isn’t your speed we can confidently steer you towards the Hummus or the Crispy Mac & Cheese Bites. That said, let’s see how the Kendall Brook Smoked Salmon stacks up. The smoked salmon itself was executed wonderfully and while we’d like to have seen more salmon stacked on top of each crisp for the $16 tendered, it was a good dish that we can recommend. This was the surprise winner of the brunch. Impossibly soft french toast has a layer of mascarpone between the halves which melts immediately sandwiched between the warm toast. The mascarpone serves as almost as a butter of sorts, which gives the whole dish delicious, buttery overtones. The caramel sauce adds a nice contrast to the toast and rounds it out wonderfully. You can’t go wrong here and kids of all ages (even the age that gets the check at the end of the meal) will really enjoy this perfectly executed take on a breakfast classic. We can definitely recommend this dish. We’re big fans of the skirt steak at dinner, so we were immediately interested on a bunch take. This is actually closer to the skirt steak offering that you can find during lunch, but with eggs and a hollandaise sauce. We were happy to see that the steak is prepared the same as at dinner, favoring the medium-rare side of things and maintaining a tenderness that really makes this dish worthwhile. Two eggs on top and a light disbursement of the hollandaise sauce rounds out the meal nicely. At $6 more than the lunch offering, you still can’t go wrong here. It’s a simple dish, but we can still give it a recommendation. Next we find the burrata on the plate in front of us. This dish is an entree portion of what can be found as an appetizer on the lunch and dinner menu, plus a few breakfast flavors. For $6 more than the appetizer, what do you get at brunch? 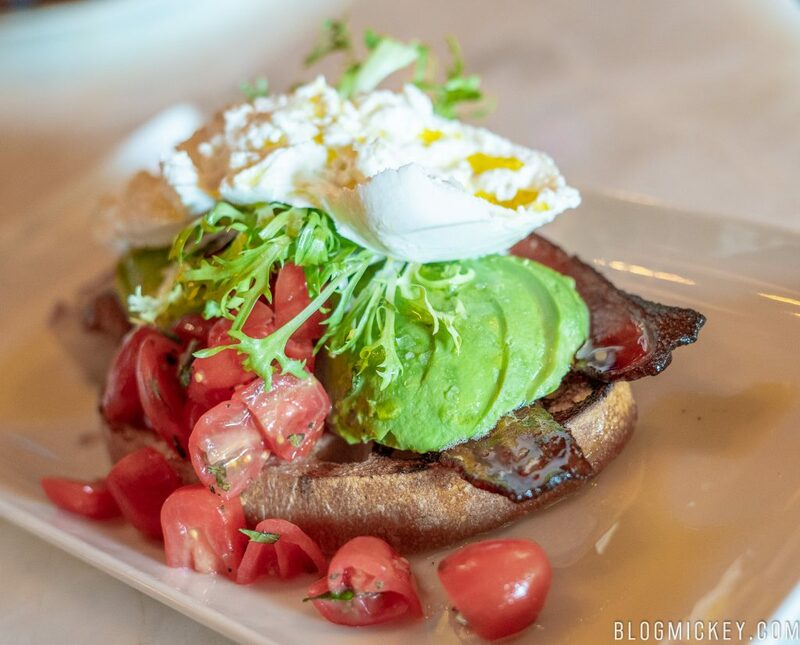 We see the introduction of a full avocado and a few strips of bacon on a slice of ciabatta that is also significantly larger than the appetizer portion. As is always the case at Wine Bar George, the ingredients here are noticeably fresh, making this a refreshing offering. We have another winner on our hands here with Wine Bar George going three for three so far on recommendations. Next up we find the sausage gravy & biscuits. These might have been the first “miss” of the day for us. That said, this is still a good dish, but maybe not on the level of the rest of the brunch offerings. Two biscuits are cut into four halves and drenched in gravy. The gravy was actually nice and thick, with a few dices of bacon. The biscuits came out perhaps a bit harder than we would have liked, but still surrendered pleasantly to a fork. At the same price-point as the french toast, the french toast wins this round. You can pass on these. Next we have the eggs benedict. The normally mushy polenta was smartly served as two crispy cakes. 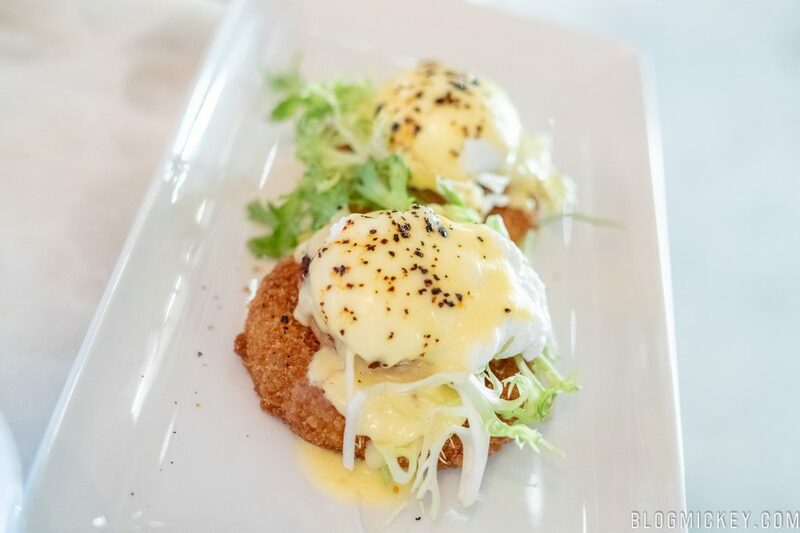 The house-made chicken sausage was wonderfully flavorful and soft, while the hollandaise adds a traditional flavor. The eggs are presented well, in a classic benedict style. As with other dishes, it was obvious how fresh the ingredients here were. We can recommend this dish! Of course, what is brunch without an omelet? 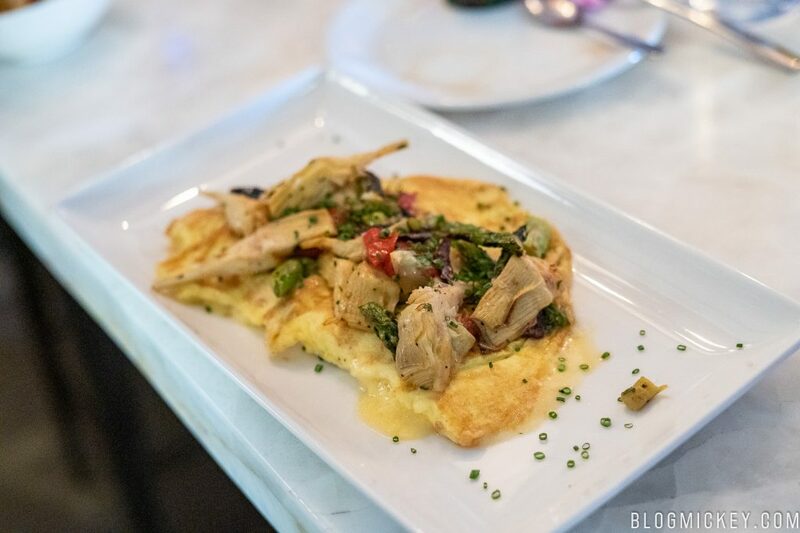 The Wine Country Omelet introduces some of the delicious asparagus that we find in the dinner skirt steak as well as some artichoke and the tomatoes that we found in the burrata. This is another good dish and the eggs were cooked perfectly. Everything works well here, and we can recommend this dish as well. 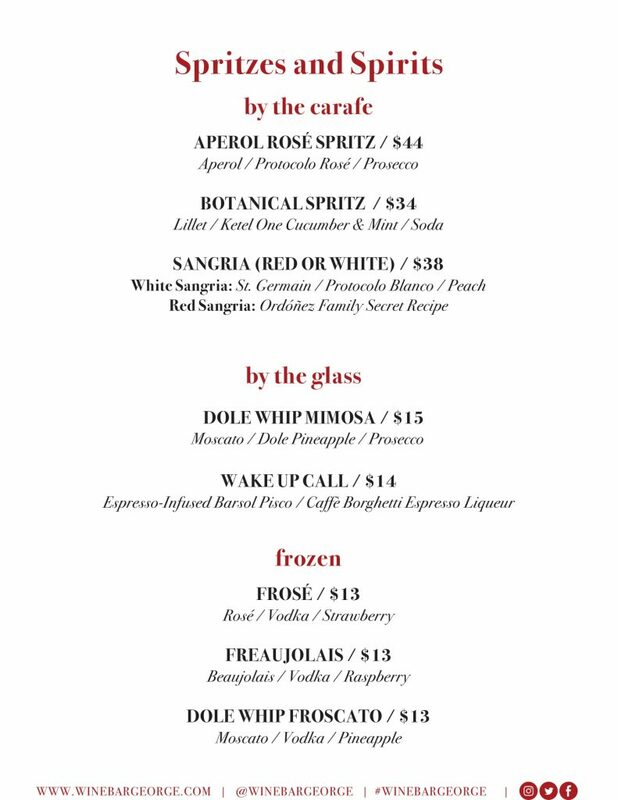 With the main plates completed, let’s check out a couple of the drinks offered during brunch. This was perhaps the driving factor for our prompt visit. The thought of a Mimosa Dole Whip was too great to ignore, but how was it? Overall, the taste was spot on of that of a Dole Whip. That said, the consistency was closer to that of a slushy than a Dole Whip. It was good, and fans of the theme park snack would likely enjoy this version as well. Interestingly enough, Dole Whip is usually spiked with a rum in the parks as an adult version, so enjoying it with the much less intense and complimentary flavor of prosecco made this a dangerously easy drink to enjoy. At $15 per glass it might be a bit pricey for the casual fan of Dole Whip. We would love to see this turned into an all-you-care-to-enjoy option during brunch as a way to really draw guests in. 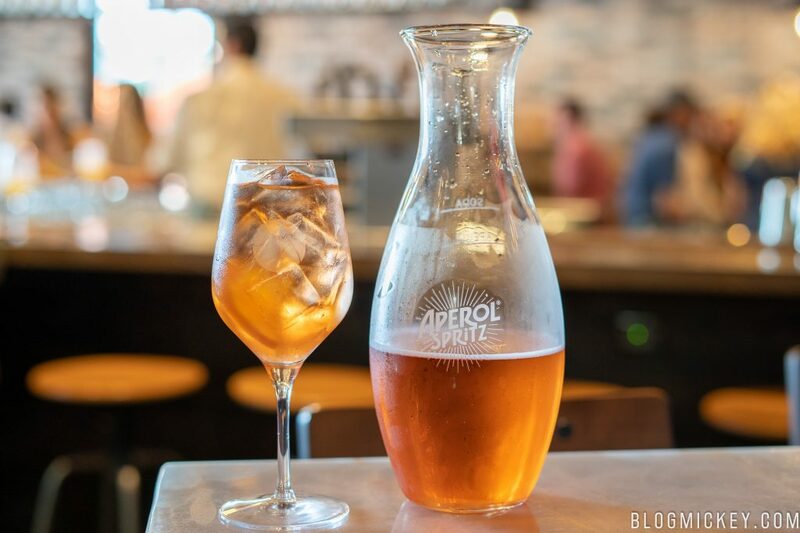 The Aperol Rosé Spritz was billed as a traditional brunch drink, but it fell woefully flat for us. It looks quite pleasant and with the promised orange flavors not even showing up in the slightest, this was a disappointment and something that we wouldn’t order again. 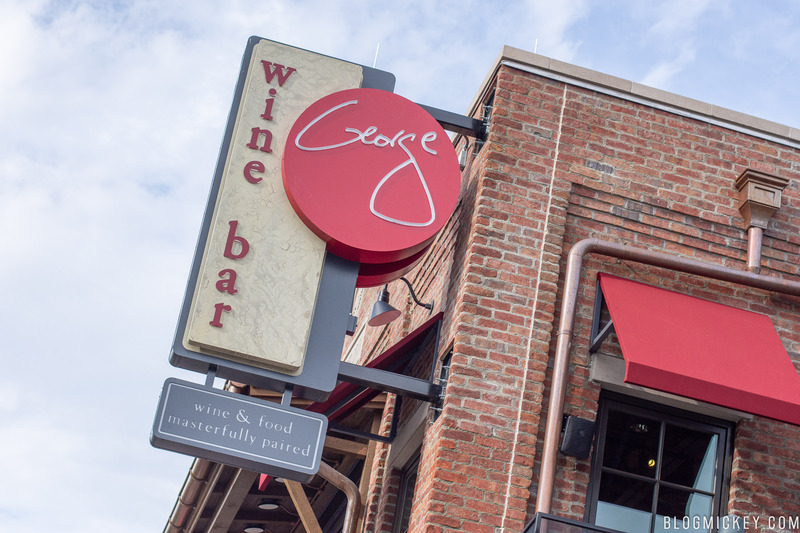 As fans of the lunch and dinner options, we’re happy to see that Wine Bar George continues their tradition of quality ingredients that are smartly combined and prepared. Discounts such as Annual Passholder and DVC are accepted for brunch. 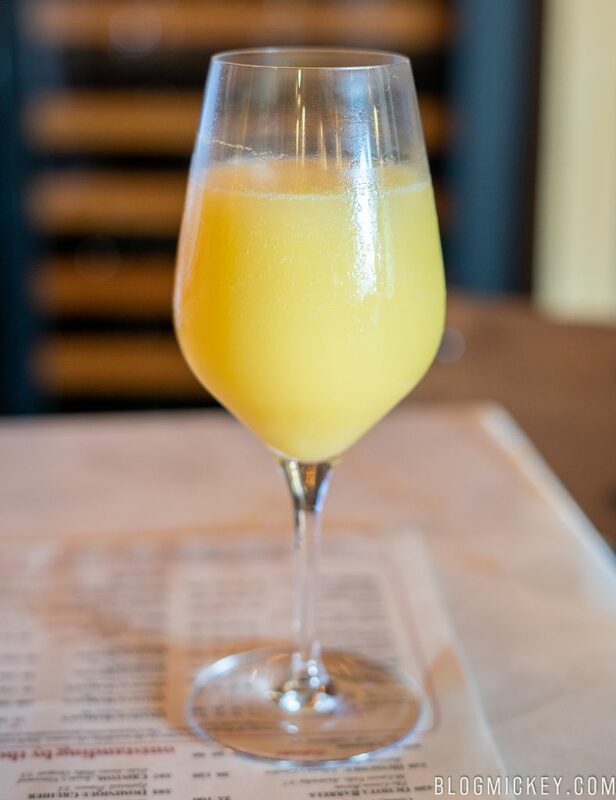 With over 135 wines available, it’s probably not surprising that Wine Bar George doesn’t accept Tables in Wonderland during brunch, lunch, or dinner. As with other meal periods, Wine Bar George sticks to a smaller menu that is prepared well. I think that’s the real genius of the location. Whereas you might find over 100 items at other restaurants, Wine Bar George focuses on perfecting each food item on the menu. 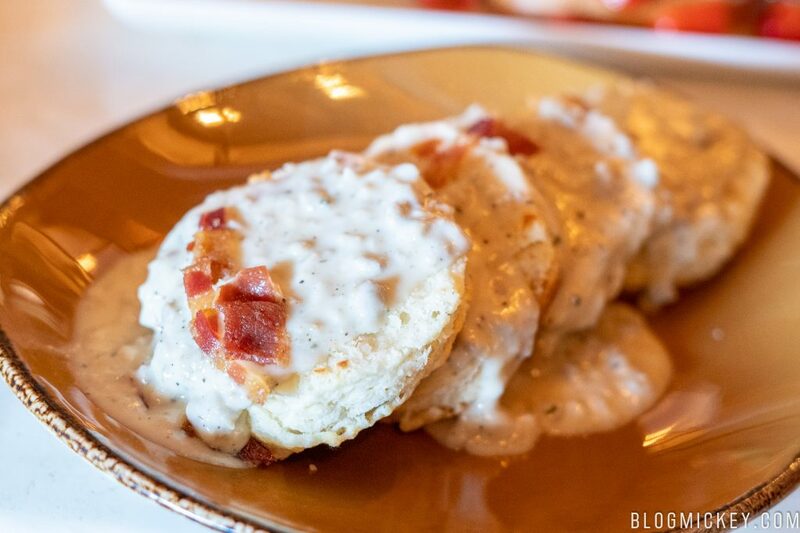 Overall, Wine Bar George comes out of the gates strong with their brunch, possibly vaulting themselves to the top of the brunch lineup at Disney Springs that we’ve tried so far. 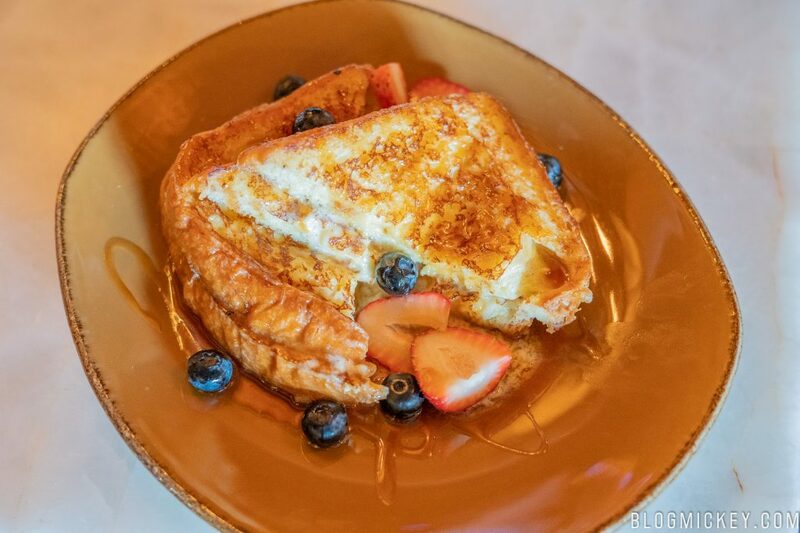 If you are looking for a good brunch option at Disney Springs, we recommend you give Wine Bar George a close look.